Never has the phrase “use it or lose it” been better applied than to our plastic brains. Which is where the obvious connections with micromastery begin. Because micromasteries are so diverse, and so fast to learn, we have the opportunity to keep using our brains, to give them the best possible workout, throughout our lives. From an evolutionary perspective a life oriented around micromastery acquisition is far more “natural,” i.e. similar to the polymathic life-style which our hunter- gatherer forebears experienced, than the curtailed and limited modern experience of mediating life through a computer screen. There is clearly an evolutionary advantage to micromastery, since our brains are wired that way. We unwire them to hyper-specialize at our peril. For example, focal hand dystonia is a debilitating ailment suﬀered by, among others, classical guitarists. The intense use of one part of the body— the hand and ﬁngers— while the rest remains immobile, rewires the brain to such an extent that it begins to perceive the areas surrounding the ﬁngers and wrist as useless. Over time, this exaggerated difference, following the “use it or lose it” pattern, causes the relatively unused areas to shut down. This results in the loss of control of even the parts needed to play guitar. In the end the guitarist can play nothing. One cure, as we have seen, is to rebuild connections by playing with the whole arm, not just the ﬁngers. This slowly reengages the brain with a balanced (i.e. not over- specialized) neural “picture” of the body. Hebb’s Law (“what ﬁres together, wires together”) is a basic observation of neuroscience. If it rains while you take a ﬁrst trip to Paris, the two will always be connected. But its broader implication is that the greater the variety of experience, the wider the sensory impact, the stronger the trace in the brain, and the greater the connectivity. This not only aids memory but also guards against senility. One wonders at the current epidemic in dementia and must concur with Dr. Merzenich—whose brain-training company treats patients suﬀering from cognitive decay— that we have made life too lacking in variety and multisensory demand. It is easy to live on autopilot, but do it for too long and basic cognitive abilities fall away. Instead, live polymathically and boost your brain. Only 3.4 percent of the population are “natural specialists.”* The rest of us become that way because of external forces, usually economic. And yet the great “rainmakers” in business are those who invent new products and even new markets by cross-fertilizing ideas from traditionally unconnected zones. By living polymathically they don’t just boost their cognitive abilities, they also manage to prosper materially. When was the last time you committed something to memory? Now that we have 4G phones we don’t need to remember anything, really, yet we’re also aware this is a small disaster. Our short- and long- term memories suﬀer for it. Merely doing what one has always done, such as a specialist does, strengthens existing networks but builds no new ones in the brain. It also means that short- and medium-term memory are used less and less. The lesson—an intuitive one only recently supported by scientiﬁc research— is simple: if you do not use your memory, it will atrophy. If you don’t visit new places where you are required to orientate yourself by, for example, learning where the shops are, ﬁnding the way back to your hotel, or even remembering where you parked your car, then you’ll gradually lose even this basic skill. And it does help to think of memory as a skill. There are better and worse ways of remembering, and the good news is that there are tricks that work. For example, keeping an accurate journal, perhaps with photographs, improves recall immensely since the major part of memory is really looking at what we are trying to recall. When everything is terribly familiar we only glance, look at the outline—and the impression made is weak. As time goes by and familiarity grows we end up living in a world of outlines with no detail at all. For this reason, neuroscientist and learning expert Michael Merzenich always tries to vary his route home, making sure to pay attention to new things he sees each day. He also talks about them, which further helps his memory. But is this enough? There is something a little ad hoc, and not a little ironic, about using one’s memory only when one remembers to. Dementia is increasingly associated not just with “not learning,” but also with becoming “bored” over time with one’s environment and taking less and less acute interest in it. This lack of accuracy degrades working memory, the ﬁrst stage in many chronic cognitive disorders. The fact that you have permission to learn anything, to experiment and indulge in a skill’s game ability once you embrace the micromastery philosophy is a reason never to be bored again. 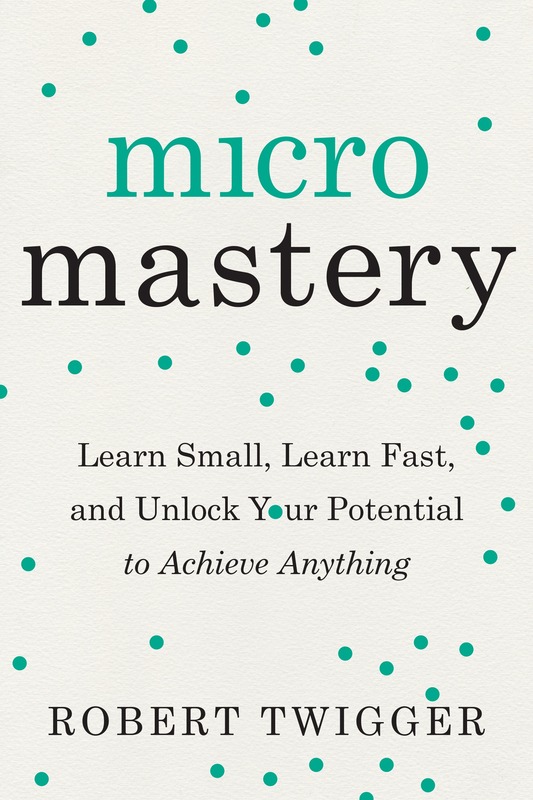 Reprinted from Micromastery: Learn Small, Learn Fast, and Unlock Your Potential to Achieve Anything by arrangement with TarcherPerigee, an imprint of Penguin Publishing Group, a division of Penguin Random House LLC. Copyright © 2018, Robert Twigger. Robert Twigger is an author, adventure traveler and apprentice micromaster. He lectures on risk management, polymathics and leadership, and lives in London.